Ambitious, multi-sectoral, cross-boundary... there is no shortage of superlatives to qualify the Coral Triangle Initiative on Coral Reefs, Fisheries, and Food Security (CTI-CFF). A multilateral partnership of 6 countries working to sustain marine resources by addressing food security, climate change and marine biodiversity, the initiative has set out a roadmap with milestones to gauge progress. To monitor this, a comprehensive framework is needed. In 2008, a Monitoring and Evaluation Working Group (MEWG) was formed to develop indicators for these goals and to provide a formal mechanism to monitor and report progress towards these goals over time. MEWG has worked with other CTI-CFF working groups to develop, revise and refine indicators and develop an M&E system that includes protocol for data collection, storage, retrieval processing, analysis and reporting. 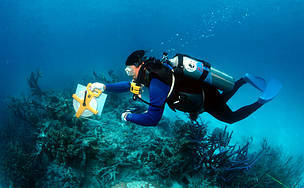 Since its inception in 2008, the USCTI Support Program (USCTI) and the Coral Triangle Support Partnership (CTSP) have been instrumental in the development of both the Coral Triangle Marine Protected Areas System (CTMPAS) and the Coral Triangle Atlas (CT Atlas, http://ctatlas.reefbase.org). Both of these platforms include national indicators that could be incorporated into a regional M&E system. formulation and publication of the CTMPAS Framework and Action Plan that has been approved by the CT6. 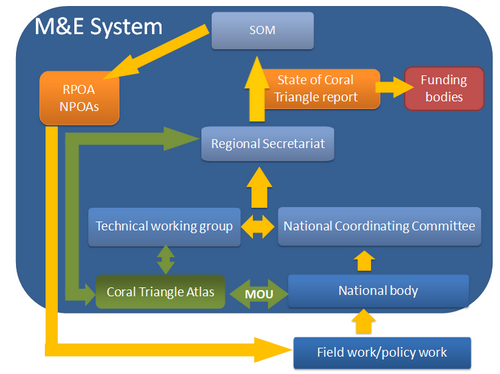 This framework includes mutually agreed-upon regional standards for classifying MPAs according to their level of management effectiveness. Meanwhile, the CT Atlas is an online GIS database that provides a centralized system of storing information and cataloguing datasets on MPAs, coral reefs and other information. The Atlas includes a wealth of data on fisheries, biodiversity, natural resources, and socio-economics, and it enables users to create layered maps to inform resource management decision-making. The CT6 have endorsed the system which will be hosted in perpetuity by Worldfish in Malaysia. The MEWG has coordinated M&E efforts with staff working on both of these projects to ensure that indicators and M&E methodology are feasible and consistent. A Memorandum of Understanding (MOU) has been developed between CT Atlas and each CT6 country that defines the terms of data sharing, including ownership and uses of the data. An important aspect of these MOUs is that no analysis of any data that is not public can be published without the country’s permission. Other database systems, such as those of the Regional Fisheries Management Organizations (RFMOs) may eventually provide another source of data for the CTI-CFF M&E System. The MEWG has presented regular updates on their progress at the various SOMs held in the region. At a CTI-CFF MEWG workshop held in the Philippines in April 2013, representatives from each of the 6 countries reviewed draft indicators and mapped the flow of M&E data and information at the country level. This mapping exercise identified responsibility centers for data collection and identified capacity gaps. Percent contribution of fish to protein requirements. These livelihood indicators are the first of their kind to be incorporated into a regional M&E framework for marine conservation and biodiversity initiative. Meanwhile, another important aspect of the development of this regional M&E system is a regional agreement on definitions for key terms such as “seascape”, “EAFM”, and “critical habitat”. The difficulties of arriving at agreements on these definitions should not be underestimated. There are concerns regarding the willingness of governmental and other agencies to share data. In an attempt to encourage data sharing, the development of regional indicators was based on an analysis of existing country M&E processes. To the extent possible, the regional M&E system will make use of M&E reporting systems that are already in place in each country. As the MEWG works towards the institutionalization of M&E within the CTI-CFF, the need for dedicated and knowledgeable staff to manage a regional M&E system has become obvious. To that end, the MEWG is recommending the engagement of a full-time Regional M&E Coordinator who will be responsible for directing, organizing and ensuring the effective flow of information between all involved in measuring CTI-CFF progress toward RPOA goals – including both data providers and users. Concerns have been raised regarding the cost of this Coordinator given that the CTI-CFF is in a start-up phase with limited funds, especially until the CTI-CFF is ratified and becomes a permanent Secretariat. The sustainability of the M&E system is also in question as current USCTI financial support is ending. The German Society for International Cooperation (GIZ) has expressed interest in supporting a M&E Coordinator. The MEWG recognizes that where possible, data collection methods should be homogenized to improve comparability. Along those lines, the socioeconomic monitoring needs further clarification. While there was general agreement to use available national official socioeconomic indicators, the MEWG must determine how to aggregate this data into a regional indicator. For now, indicators will be reported on in their current disaggregated form. An outline for a CTI-CFF M&E System Operations Manual has been approved by the MEWG. The Manual will be oriented to the primary users of the M&E system, and include sections on the development of the M&E process, a description of the objectives and their corresponding indicators as well as a description of the organizational, information, and communication management for M&E. A final version of the Manual should be presented at the next SOM tentatively scheduled to take place in the Philippines in September 2013. Ultimately, the CTI-CFF M&E System will be housed within the CTI-CFF Secretariat. The CTI-CFF is currently operating as an interim entity until it is ratified by at least 4 of the 6 CT countries. For now, the Philippines is leading the MEWG and will continue to do so. TNC will continue to provide some support to the MEWG, though it will largely be up to the countries to sustain the M&E system until it is transferred to the Permanent Secretariat.